Voorzijde: Buste van Sint Petrus met nimbus binnen een negenbogige omlijsting, boek in rechterhand, twee sleutels in linkerhand. Daarvoor gevierendeeld wapenschild met de leeuwen van Bohemen, Brabant, Limburg en Luxemburg. Omschrift: +WENCESLAVS Z IOH'ANA - DEI GRA BRAB DVCES. Keerzijde: Dubbel gebloemd kruis binnen parelring. Obverse: Bust of Saint Peter with nimbus within nine arches, holding book in his right hand, two keys in left hand. Quartered coat of arms before with lions of Bohemia, Brabant, Limburg and Luxembourg. Reverse: Double floriated cross within beaded border. 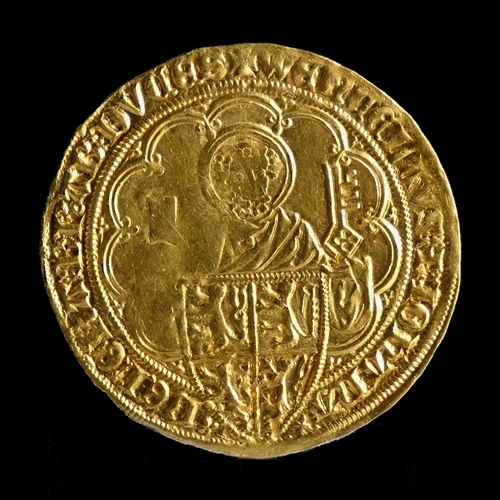 Gouden Pieter or Pieter d'Or. 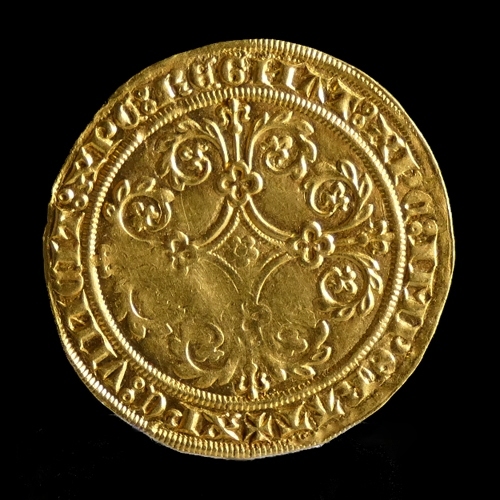 This popular gold coin from the Duchy of Brabant was used well into the 16th century. This type was also used by Philip the Good, Duke of Burgundy (1430-1467) and stuck in Louvain in 1431, and at the mint in Zevenbergen from 1429 to 1433. Joanna, Duchess of Brabant (1355-1406), also known as Jeanne de Brabant, daughter of Duke John III (1312-1355) married Wenceslas, son of John the Blind, Duke of Luxembourg in 1352. After the death of Joanna in 1406 the Duchy of Brabant passed to her great-nephew Antoine, son of Margaret III, Countess of Flanders.